Arash SOTOODEH | آرش ستوده – Welcome! 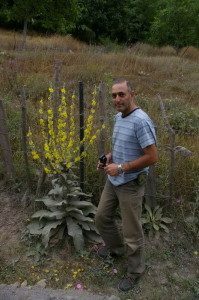 * Biogeography, evolution and molecular phylogeny of Verbascum and Artemisia in Iran. * Evolution, morphology, Systematics, molecular phylogeny and biogeography of angiosperms. 2013 Oral: “Molecular phylogeny of Turkish and Iranian Artemisia using ITS and ETS”, in: Young Systematists’ Forum, Natural History Museum, London, UK. 2013 Oral: “Biogeographical and molecular phylogeny of Turkish and Iranian Artemisia with ITS and ETS”, in: BioSyst.EU 2013 Global systematic, Vienna, Austria. 2012 Poster: Preliminary results of molecular phylogeny of Turkish and Iranian Artemisia with ITS and ETS. in 34th annual meeting of Biology and Population Genetics Study Group – “Petit Pois Déridé” (PPD). INRA, University of Avignon, France. .
2006 Poster: Ghaffari, S., Sotoodeh, A., Meiotic & Mitotic studies on six cultivar of Lentil (Lens Culinaris) from Iran. in: IV Balkan Botanical Congress, Bulgarian Academy of Sciences, Sofia, Bulgaria. Attar F., Sotoodeh A., Mirtajaldini M. (accepté 2019). Teucrium elymaiticum (Lamiaceae): a new species for Flora of Iran. Mediterranean Botany. Sotoodeh A., Attar F., Andalo C., Mirtajaldini M. And L. Civeyrel. (2018). Focusing on three Verbascum L. taxa (Scrophulariaceae) of the Flora of Iran. Adansonia, 40:171-181. Maassoumi A. A., Sh. Kazempour Osaloo, A. Sotoodeh (2016). A new infrageneric grouping of Astragalus (Fabaceae). The Iranian Journal of Botany, 22: 88-100. From 2015 Member. Central herbarium of Tehran University (TUH). 2000–2010 Administrator and IT manager, in different public & private organizations, Iran. 1999–2000 Laboratory Assistant in Cytogenetic Lab. Institute of Biophysics & Biochemistry, Tehran University. 2013–2015 Enseignant vacataire, UPS FSI Département Biologie & Géoscience: Floristic course, Université Paul Sabatier, Toulouse, France.